There’s one question you have to ask before providing a new space in your facility. Will the conditions inside be suitable for the work being done? Most work environments need some degree of temperature control, and Panel Built’s modular system has adapted to suit these needs. Our panelized walls themselves can be adapted to increase the R-Value, the capacity of a material to resist heat flow. However, protecting an environment from the outside heat level only goes so far to control its internal temperature. For that, you will need an HVAC system powerful enough and suited for the building. Since our buildings suit a variety of applications, we have adapted HVAC systems that will suit each situation. In most instances, our HVAC units will be implemented as through-wall units, meaning that it will be situated inside one of the wall panels. Part of the unit will be inside the building, pushing air into the building and the back side will pull in air from outside. In the majority of modular office projects, a through-wall unit will be used in order to heat and cool the space. One of the biggest advantages of this unit is the maintenance of the unit. Although you likely will not think of this in the design phase of your modular building, HVAC maintenance will be a necessary evil no matter what brand of unit is being used. If the building is being installed into a hazardous environment, being able to maintain the HVAC from inside the building will be vital. The HVAC technician will be able to work on the unit inside the comfort of the building and the unit will be at an elevation level the makes it easier to work on. 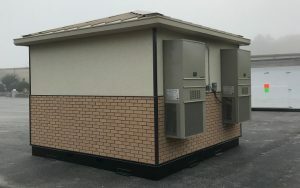 Compared to a roof-mounted system, through-wall units are generally much more convenient to work on, especially in multi-story buildings or ones with restricted exterior access. Panel Built’s Standard Through-Wall unit will provide 9,000 BTU’s of cooling and 11,500 BTU’s of heating. This is our standard unit because it is highly cost-effective overall. The initial cost of the unit is fairly low, but still has high energy efficiency, has a long life-span, requires low maintenance, and still comes with a number of HVAC features like remote controls multi-directional airflow and easy filter changing. Our Standard Through-Wall unit can also be installed with a heat pump added in. Adding a heat pump into your HVAC system will allow the system to pull heat from outside air into the room, lowering the overall cost to heat the room. For larger spaces or more specialized applications, Panel Built will utilize a Bard unit to help heat and cool their modular spaces. The one-ton bard unit shall be of ample capacity for approximately 400 square feet per ton of cooling and heating. The air handlers are mounted at floor level or on the wall of the building. The system uses twin blowers to keep it operating as quiet as possible while operated in fully ducted and non-ducted systems. These systems are seen as some of the most reliable and long lasting air conditioners available on the market, often being utilized in schools, telecommunication centers, equipment buildings, and modular construction projects. For supplemental heating, Panel Built can install an electric baseboard heater into the modular building. These units work best when utilized in rooms that have a tendency to get cold and stay cold but do not need to stay warm all the time. They effectively warm rooms quickly using a quiet convection heating system. These systems are all UL approved and factored rated at 120V and 208V. Baseboard heating systems will operate most efficiently when installed under a window and approximately 1′ away from equipment or furniture. When used in a Panel Built project, baseboard heaters can often be found in guard buildings underneath the guard’s desk. The guard booth may have both an HVAC and a baseboard heater. 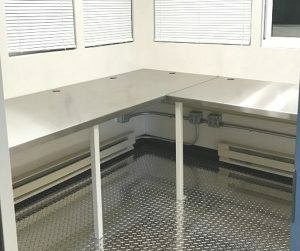 If the guard booth is empty overnight, the HVAC can be turned off, and when the guard comes in, the baseboard can be used to heat the booth quickly, while the HVAC can regulate the building throughout the rest of the day. 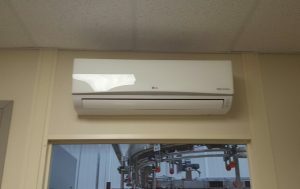 In a modular office building that has a number of different sections or individual offices, a ductless mini-split system may be used, especially if the offices are likely to be at a variety of temperatures. 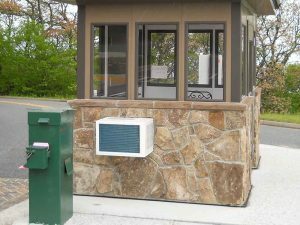 The mini-split system utilizes a two-part system with a condenser and x number of air handlers throughout the building. 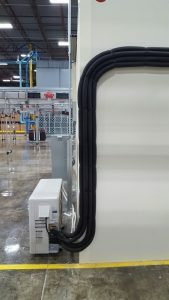 Air handlers are mounted on the wall and ceiling, while the condenser units can be found on either the exterior or roof of the building with all conduit and refrigerant lines sealed in penetration through the building’s walls. Ultimately, Panel Built utilizes a variety of HVAC types in order to find the right fit for your modular application. In projects ranging from equipment enclosure, a small space requiring a very controlled environment, to large, open-room modular office buildings, we can utilize a combination of HVAC units to keep a constant temp without wasting energy. If you have questions as to which HVAC system to use in your next modular office project, just give us a call at 800 636-3873 or send us an email at info@panelbuilt.com. As the modular building experts, we have the product expertise and know-how to provide you with the structure that will best fit your needs (and budget).